Marine Area 7 is open now to ONE hatchery marked Chinook until the end of October. Crab is open seven days a week. Get your tickets now to the Friday Harbor Salmon Classic, and Roche Harbor Salmon Classic. Both Derbies are close to sold out! The salmon fishing is closed in Area 11 until Feb. 1st, 2017 , however MA13 is open for hatchery chinook and southwest of a boundary line from Devils Head to Tolmie State Park is open for hatchery Coho also. Trolling flasher and spoons or artificial squid for immature chinook near Pt. Gibson, Green Pt. area or the mouth of Wollochet Bay can be productive. For Coho near the Squaxin Island net pens which can be challenging there will be schools of Coho traveling the shoreline when you find a school of Coho try casting Vibrax spinners or Buzz Bombs into the schools of Coho. Squid fishing has been good this week with the big tides and should get better the closer we get November. Cost $15 Learn the regulations, locations to fish, equipment and tackle . Also care, cleaning and cooking. Call 253-591-5325. I had a couple of hours this afternoon and got out on Greenlake for a quick troll around the lake. It was windy and I only counted three bank anglers and one guy fishing out of an inflatable with an electric motor. I picked up one rainbow right off the bat that slammed a small Rapala I was trolling. By first glance it looked more like a steelhead. It fought like crazy until I got it to the net and back into the water. One more quick take down before I headed in came along the weedline. I haven’t followed the stocking patterns of Greenlake. You can usually tell by the number of bank fishermen and Cormorants around the lake. 🙂 I’m always hoping to hook a German Brown Trout which I’m told are in this lake and reproducing. Another day. It’s been a few months since I’ve fished Lake Sammamish. It’s just that much longer that I have to sit in my car during rush hour on the drive home. 🙂 I had planned on fishing a different part of Lake Washington that day but the white caps and southerly wind didn’t look like a fun kayak fishing experience. Lake Sammamish was not that much calmer. There were 15 mph winds and rain blowing sideways when I arrived. By the time I launched the rain had ceased – for the moment anyway. I began trolling a small Needlefish spoon tipped with a small worm using leadcore line. I worked about a mile and a half up the east side of the lake marking a few fish suspended but not active. I switched over to a Wiggle Hoochie and decided to cross the “washing machine” to the west side of the lake. I was in roughly 100 feet of water when I took a slight pause from pedaling. My rod buckled over. The wind was blowing me down the lake as I struggled to get the fish in position. I landed a beautiful 18″ rosy cheeked cutty. I would get another couple take downs landing one more nice fish. Both were released unharmed. We’ll be filming a kayak fishing television show for YakFish TV in the coming weeks on this fishery. I’ll be sure to share the footage when it becomes available. Tight Lines! 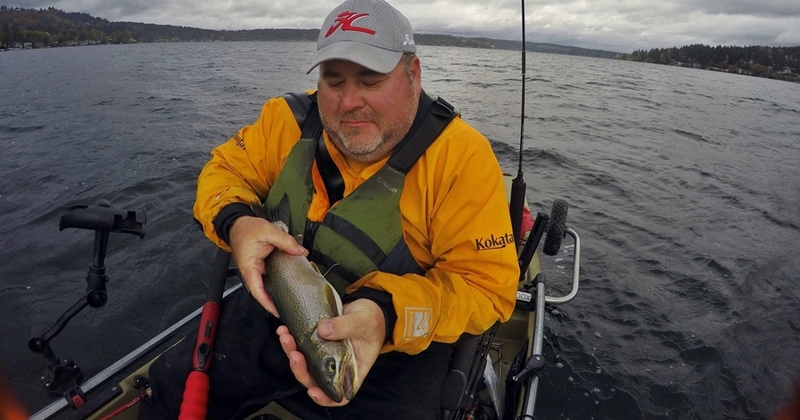 My hunt for cutthroat trout on Lake Washington has been a tough one. The fish seem to like the choppier days on the lake. I’ve found tipping a Needlefish spoon or Wiggle Hoochie with a small piece of worm can really make a difference in the bite. The lake is still warm and has yet to turn over. If you’re a perch fisherman, fall is a great time on the lake. You’ll find huge schools from 25 to 60 feet of water. Drop anything in front of them and you’re sure to get a bite. For deeper areas I like a weighted Krocodile spoon or lead jig over bait. I had fun with a light weight bass rod the other day jigging a drop off for large pikeminnow. I like to think of them as “poor man’s lake trout”. Have fun out there! The water level is still coming up fast. I fished a couple days with modest success; not vertical jigging but going back to using bottom walkers and worm harnesses. When I either hook a fish or just miss a bite I mark the location and then repeat the troll pattern. You can get well into the dunes for bass because of the water level but remember that the duck hunters are now also out there. We had the forecast this past of very bad weather like the west siders. My son Scott came over taking me granddaughter Bridgette. Saturday they left the dock at 3:30 to get their spot expecting the high winds to blow them off the water. They ended up with 4 ducks and got off the water before high winds started. It turned out not to be that bad. They went to bed with 30 to 40 MPH winds and waking up at 3AM the winds were predicted to be coming. Back to bed to catch some needed rest. By 7Am they awoke to light winds but the early morning flight would be over. So much for a second day for duck hunting. I was on the west side this weekend and seen the panic brought on the winds and rain of the century. Stores were jammed with shores. Some shops closed up early for the storm that did not happen for the most part. Salmon fishing was HIT AND MISS this past week. 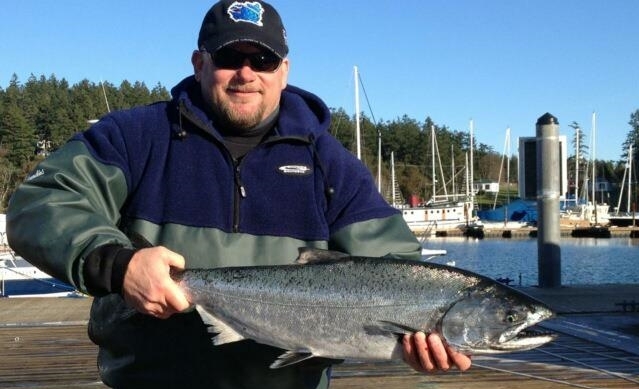 The coho fishing has been the focus of anglers. Most of the coho have been from 7 to 11 lbs with the odd “teener” being caught. Those who targeted coho did quite well using spoons and hootchies and were having their best success in water depths from 200-500 feet. The odd springs in the 20’s has been taken as incidental catch while fishing for coho. Anglers using bait are finding anchovies in glow teaser heads have been working best. Also good are spoons, such as the G-Force and Skinny G, in Bon Chovy or Outfitters’ colours. For flashers, the Betsey, Lemon Lime and Green/Silver Hot Spot have been good. Salmon fishing was SLOW again this past week. There were some springs up to 8 lbs caught on the flats but not too many. The coho haven’t been running strong in this area as well. 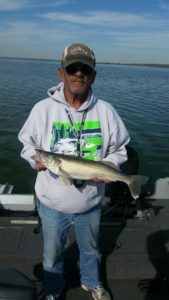 Good trolling lures have been Coho Killers, Bon Chovi or Outfitters Skinny G spoons or AP Tackleworks needlefish spoons. Anglers jigging have been using Needlefish Darts, Point Wilson Darts or Deep Stingers. Halibut fishing was FAIR this past week. However, most anglers that were fishing for halibut were using extra large herring, salmon bellies and/or octopus for bait. Also working well was the 9” Jumbo Squid in Green Glow. Also working well, and discouraging to dogfish, was the 9” Jumbo Squid in Green Glow. Salmon fishing was HIT AND MISS this past week. The coho fishing is best out at water depths of 450 feet or more in the shipping lanes rather than in close. Most of the coho have been from 8 to 14 lbs. 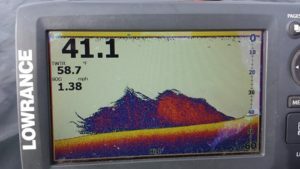 The best depths for coho were from 90 to 120 feet on the downrigger. Small spoons with green color have been the best lure to use. The chinook fishing has definitely slowed down in Pedder Bay. Most of the springs being caught are small feeder springs .Hootchies and squirts with a green and glow color combination have been good plastic baits to use, especially with a 28” to 32” leader. Anchovies were still working this past week. Good choices for teaser head colors are UV Green, Chartreuse, Bloody Nose and Purple Haze. Flashers that are popular include the Betsey, Lemon-Lime and Madi. Salmon fishing was SPOTTY this past week. The Pender Bluffs produced a few coho and the occasional chum salmon. However, the bite periods were infrequent. The coho were in 40 – 120 feet depths. We did hear of a 12 and 9 lb winter (feeder) springs caught by Hambley Point. Anglers using spoons found Coho Killers, Gibbs Needle G and AP Tackleworks needlefish spoons the most successful spoons this past year. The salmon fishing was SPOTTY for coho if you could find them. The hatchery fish were running from 7–15 lbs and some of the wild, unmarked coho were even heavier. The unclipped fish once again greatly outnumbered the clipped fish this past. The coho have been found most often in 400 to 600 feet of water and at depths from 50 to 120 feet. The best bet is to fish the tide lines with spoons and plastics the most popular lure choices. Anchovies are still a good choice for bait and good choices for teaser head colors are UV Green, Chartreuse, Bloody Nose and Purple Haze.The top spoons for Sooke anglers have lots of green and glow/white has been working well. For flashers, you can’t go wrong with a Super Betsey, Madi or Bon Chovi Flasher. Hootchies in White, Glow/Green and Purple Haze have been effective recently. Fishing for salmon was SLOW this past week. The best fishing has been out at Constance Bank where there are some feeder springs up to 8 lbs. However, most of the springs there are around the minimum size (45 cm) for retention. Some coho are also getting caught there but it has been spooty for them. Spoons have been very successful in getting hook ups but you have to check you line every 10 minutes for shakers. Green Spatter Back UV Coho Killers, 3.5” Cop Car spoons or AP Tackleworks needlefish spoons have brought good results at Constance Bank. Halibut fishing was FAIR this past week with the best areas being Constance Bank, Border Bank and the Mud Hole. Anglers that were fishing were using extra large herring, salmon bellies and/or octopus for bait. Also working well, and discouraging to dogfish, was the 9” Jumbo Squid in Green Glow. Trout fishing is GOOD on most lakes in the South Island area. 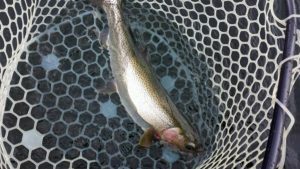 The Vancouver Island Fish hatchery has started the fall stocking program of catchable triploid rainbow trout. On September 29th, Langford Lake received 600 trout averaging 744.12 grams in size. On October 4th, Thetis Lake received 1,000 trout averaging 203.65 grams in size and Langford Lake received 2,000 catchable rainbow trout averaging 203.65 grams in size and 188 rainbows averaging 744.12 grams in size. On October 5th Elk Lake received 2,000 trout, Kemp Lake 750, and Matheson Lake 500 trout averaging 202.5 grams in size. On October 6th Prospect Lake received 2,000 trout, Glen Lake 500, and Durrance Lake 1,500 trout averaging 181.15 grams in size. There’s nothing like a fall road trip to visit new lakes and map out a new area. 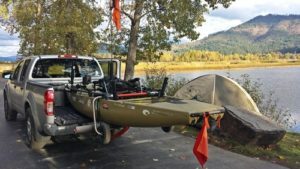 A friend and I caravaned our kayaks the 5.5 hours to the Idaho Panhandle in search of Northern Pike and other fresh water monsters. Killarney Lake is one of Idaho’s “Chain Lakes” that connects to Lake Coeur D’Alene through the Coeur D’Alene River. We camped out in the frigid temperatures sharing the campground with one bank angler and a group of deer hunters. Upon arrival the gentleman next to us we could see filleting two small Northern Pike that he had caught fishing a chunk of herring under a bobber near the weed line… I prefer covering more ground in my kayak so we set off just before dusk pulling a variety of Shad Raps and Rapalas around the lake. The only takers were some nice sized crappie and a 4 lb largemouth bass I would lose at the edge of the kayak. We tried it again the next morning switching to dropshot along any structure we could find. I was surprised finding largemouth so shallow in 52 degree water. I’ll have to plan another trip over in the spring when the fishing is supposed to be better.